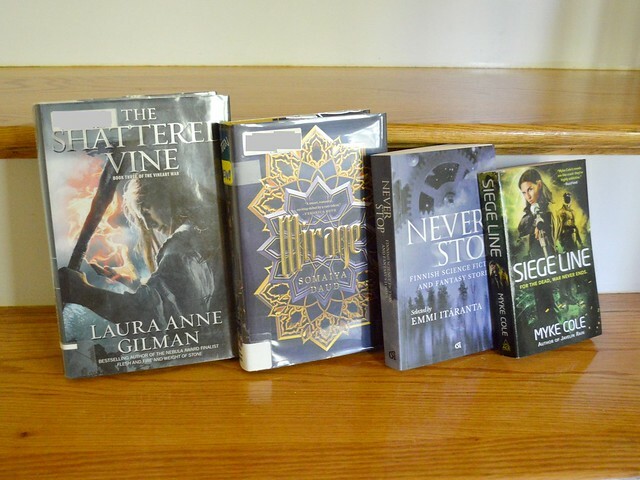 From left to right: The Shattered Vine (book 3 of the Vineart War) by Laura Anne Gilman, Mirage by Somaiya Daud, Never Stop: Finnish Science Fiction and Fantasy Stories, an anthology edited by Emmi Itäranta, and Myke Cole’s Siege Line. 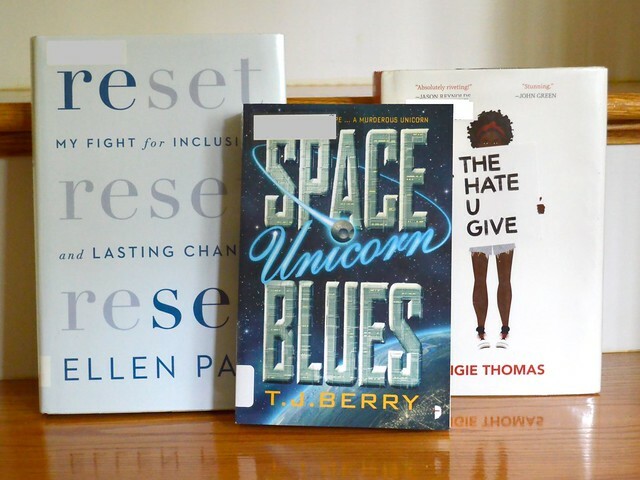 And more from an inter-library loan haul: Reset: My Fight for Inclusion and Lasting Change by Ellen Pao, Space Unicorn Blues by T.J. Berry and Angie Thomas’s The Hate U Give. The last one I’m reading for the banned books week. In addition, Unthinkable: An Extraordinary Journey Through the World’s Strangest Brains by Helen Thomson is also back at the library. What a fascinating read that was! 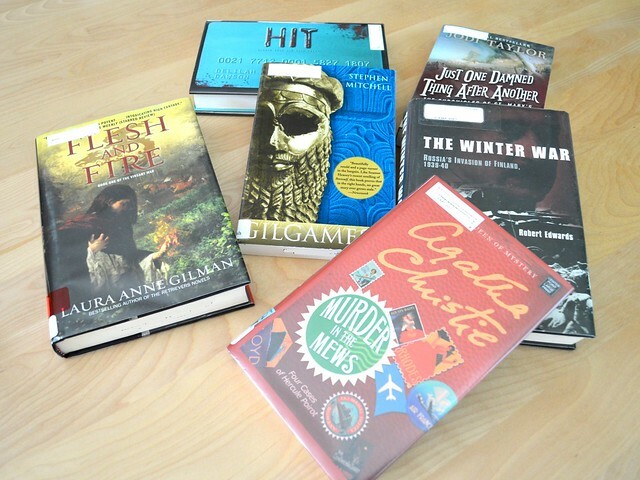 Anything especially intriguing in your TBR pile? Do share! Phew! So far I’ve been way too busy to do any gaming, and I’ve barely touched my TBR pile in August even though there’s plenty I’d really like to read. 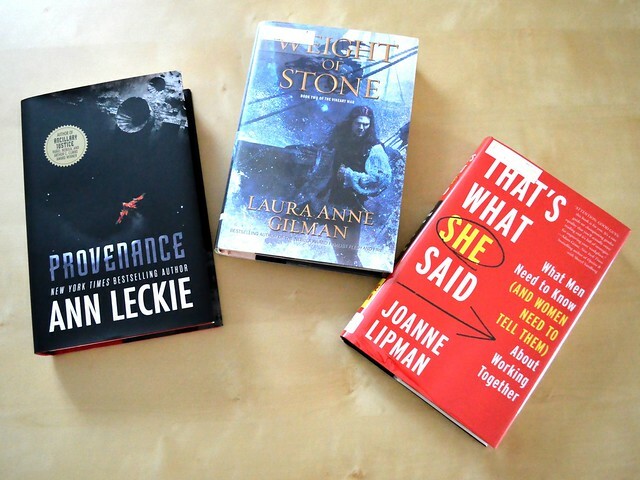 From left to right: Ann Leckie’s Provenance, Weight of Stone (sequel to Flesh and Fire which I read last month) by Laura Anne Gilman and That’s What She Said: What Men Need to Know (and Women Need to Tell Them) About Working Together by Joanne Lipman. I wonder whether I can get through all three; I’ve started Lipman and Weight of Stone, at least. From left to right: Flesh and Fire by Laura Anne Gilman, Hit by Delilah Dawson, Gilgamesh: A New English Version by Stephen Mitchell, Murder in the Mews by Agatha Christie, The Winter War: Russia’s Invasion of Finland, 1939-1940 by Robert Edwards and Just One Damned Thing after Another by Jodi Taylor. 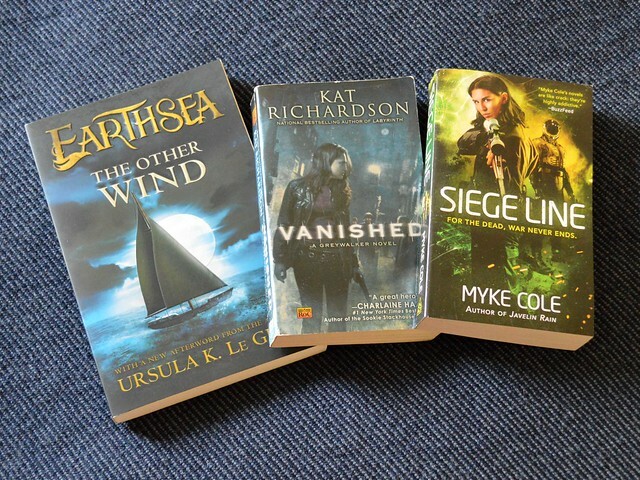 From left to right: The Other Wind (more Earthsea stories) by Ursula Le Guin, Vanished by Kat Richardson and Siege Line by Myke Cole. Plus, I’ve already read some non-fiction and the novelette Ironclads by Adrian Tchaikovsky. Anything special in your reading pile? Yes, it IS Inigo! Smack in the middle in a fancy gilt frame. From the small but unabashedly colorful and inventive home of freelance designer and author Peaches Freund. Found via design*sponge – visit the post for more photos of Peaches’s incredible style! Books & Mags, Geek out! 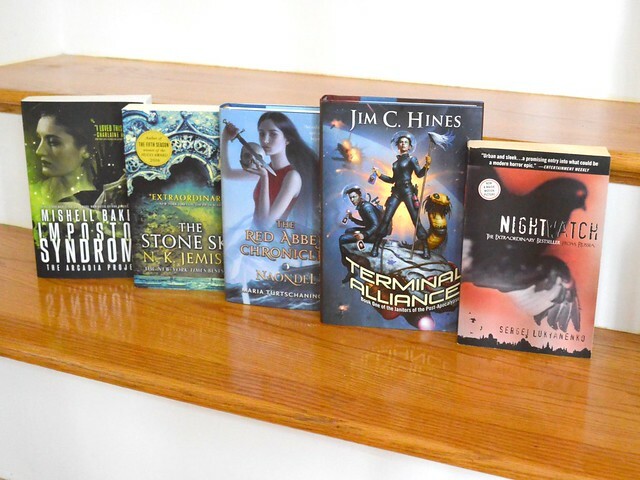 From left to right, Impostor Syndrome by Mishell Baker, The Stone Sky by J.K. Jemisin, Naondel by Maria Turtschaninoff, Terminal Alliance by Jim C. Hines and Nightwatch by Sergei Lukyanenko. 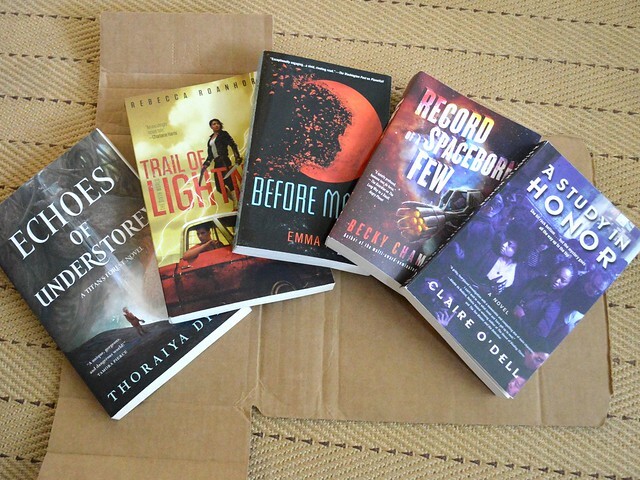 I’ve already read a bunch, too, including Space Opera by Catherynne Valente, Crossroads of Canopy by Thoraiya Dyer and The Gentle Art of Swedish Death Cleaning by Margareta Magnusson. 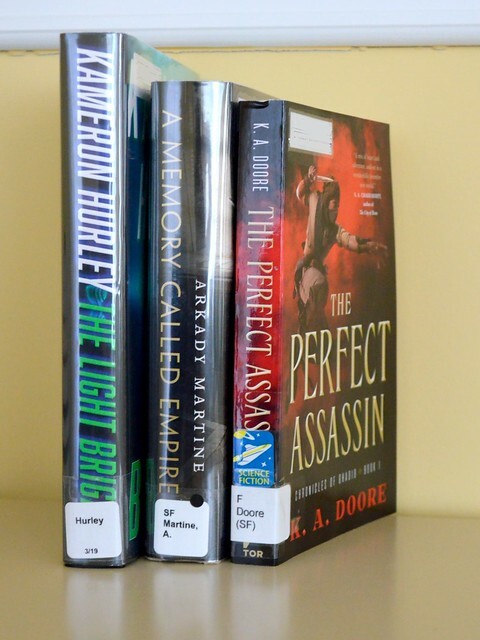 An honorary mention has to go to Autonomous by Annalee Newitz. It’s her debut novel, it was fantastic, and I’m looking forward to reading more of her long fiction! For some years now, I’ve kept a tally of the books I read. 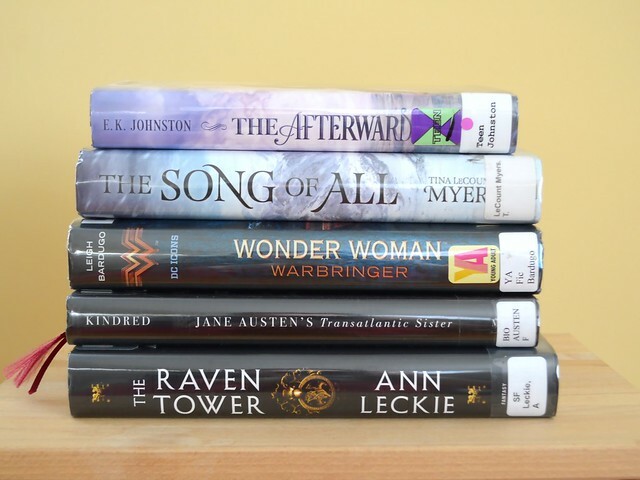 In earlier years, I’ve blogged about a gender-breakdown on my reading. While interesting, it’s starting to get monotonous. Time to try something else! Anyway, back to books. 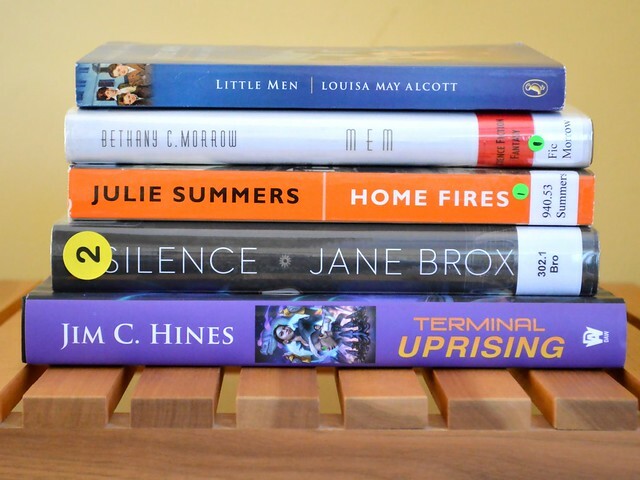 Here, alphabetically by title, are the nine most memorable stories I (re)read in 2017. I resisted picking up this novella because of the name Murderbot, but I’m really glad I did. A self-aware, self-named, part-synthetic, part-organic grumpy SecUnit bot reflects on personhood and solves a mystery involving sabotage and incomplete data. Also, first person POV that works really well. Looking forward to more in the series! The final novel in the Divine Cities trilogy with action, philosophy and politics plus gripping characters and fates. While I didn’t care that much about the two preceding books, I actually felt genuinely sad at the end of CoM. Sequel to The Long Way to a Small Angry Planet but works as a standalone. We focus on Pepper and the AI Lovelace and learn more about Pepper’s past (as a genetically modified child slave) in a story that is at least optimistic if not outright happy. Love it as much as Angry Planet; looking forward to July and Record of a Spaceborn Few. 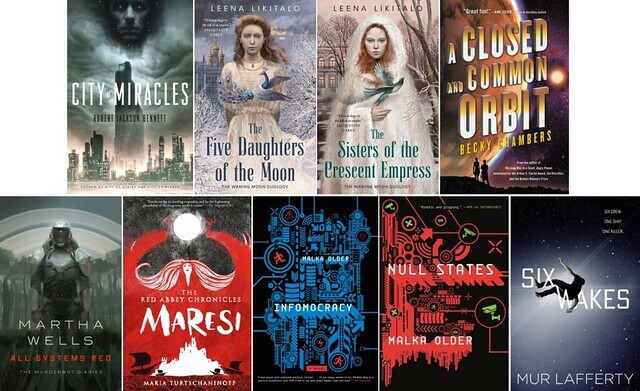 Inspired by the 1917 Russian revolution and the last months of the Romanov sisters, together these novels make up the Waning Moon duology. Beautiful, creepy and haunting all at once. Likitalo is a fellow Finn. Two first installations in the Centenal Cycle trilogy about microdemocracy, a fascinating idea. Looking forward to September and State Tectonics. Another fellow Finn. The Red Abbey welcomes a new arrival whose past unfortunately brings problems for all the inhabitants of the island. I enjoyed it so much I read it twice AND dragged with me to Finland to Worldcon 75 to be autographed. I’ve also already bought the sequel, Naondel, but haven’t gotten to it yet. A murder mystery in space, with clones who cannot remember their previous lives. Awesome unveiling of the plot, characters and timelines. What did you read last year that was special?